If your kids love watching Wow! Wow! Wubbzy! which is one of the most watched Nick Jnr programs, simply continue reading to learn about the Wubbzy fire engine episode. Which your kids will most likely be interested in watching. However, Widget makes Wubbzy to promise not to use his fire engine in the case of a real emergency, as she didn’t create Wubbzy’s fire engine to put out real fires. Wubbzy quickly agrees not to use his fire engine in an emergency, assuming that a real emergency won’t arise. As Widget tells Wubbzy that fires should be left to professionals to deal with. 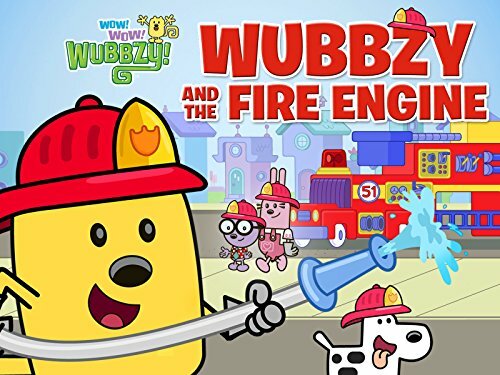 However, he soon finds himself in hot water when a real emergency occurs and Wubbzy has to decide whether to keep his promise to his best friend, Widget or to try to use his fire engine to try and put out the fire. Although Wubbzy is definitely tempted to try and put out the fire in his town out, Wubbzy instead decides to get his friends help and in the end, Wubbzy and Daizy hop into Wubbzy’s fire truck together in order to find real fire professionals, to put out the fire which Wubbzy discovered. Which was a win-win solution as Wubbzy was still able to use his firetruck to help put out the fire, without putting himself in danger or breaking his promise to his best friend. When Widget finds out that Wubbzy didn’t try to use his fire truck to put a real-life fire, she is proud of her friend. What does Wubbzy’s fire engine look like? Wubbzy’s fire engine is a fully working fire engine which Widget designed to have flashing lights, an extendable ladder, a working hose, and a net to catch things. Such as cats which jump out of trees. Wubbzy and the Fire Engine premiered in season 2 of Wow! Wow! Wubbzy! and features Wubbzy, Widget, Daizy, Walden and Chef Fritz. The latter of whom is not a main character like Wubbzy, Widget, Walden, and Daizy but a reoccurring character. Chef Fritz is a citizen of Wuzzleberg, the town which Wubbzy lives in with his friend and owns and runs the Yum! Yum! Restaurant. Which Wubbzy and his friends visit in certain episodes. Chef Fritz is modeleld on a cat and is orange in color and is always seen wearing a white chef’s hat and a matching white chef’s coat. So if your kids love watching Wow! Wow! Wubbzy! but haven’t seen Wubbzy and the Fire Engine it’s well worth tracking it down as it’s a fun episode with lots of positive messages. Such as the importance of personal safety and keeping your word.